This entry was posted on March 26, 2010, 8:28 am and is filed under data, Music, recommendation. You can follow any responses to this entry through RSS 2.0. Both comments and pings are currently closed. Great idea by amazon and possibly a sign of things to come: Sooner or later all our digital media consumption will be tracked by some service (I’m looking at you, Apple ;)). Amazon should buy http://www.goodreads.com and embed their reading histories with a social network, creating “neighbors” who’re currently reading the same chapter as you and so on. Amazon already bought Shelfari, which does exactly that. I am into this in a nerdy way you cannot fathom. The lists you suggest sound interesting, but even more I’d like to see the stats for a particular book that I’m looking to buy. Knowing what percentage of people finished a book would be more valuable information to me than reader ratings and reviews, which are biased by self-selection. Great idea. Make sure you email amazon.com about it. They pay attention to this stuff. Bookstat nerds. Never thought I’d see that. But I wonder how authors will feel about seeing some of those statistics. Will they really want to know that, say, 40% of the people that bought their book never finished it? And, does that imply problems with the book, or something about the readers that never made it through? Love your ideas! If the information is gathered anonymously – which is entirely possible despite user IDs being integral to the app-buying process – then why not? Wow, amazing idea. 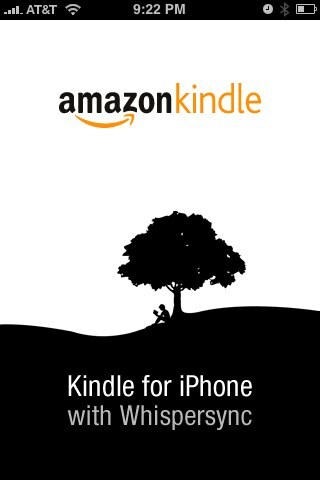 Am just finishing my first book on Kindle for iPhone, and I can certainly see more purchases in the future. I recently read a comment along the lines of “5 star enjoyment, 2.5 star writting”. Using a combination of reading speed and page turner stats, you could get a good feel whether a book would be a nice easy read or something more involved. :-) feeling pleasently chuffed at the fact that I have read all of “A Brief History of Time” and it’s sequel, “The Universe in a Nutshell”. Pageturners? Trophy books on a Kindle make no sense. No one can see you pretending to read them or sitting on your bookshelf. Way cool! Its already known that most non-fiction books aren’t finished. I read once that the majority of people read the first chapter and that’s it. You know some maniacal literary snob or political wing-nut would create an app to make it look like they did indeed read—and finish—all the “right” books . . . at a brisk pace. Book marketing would never be the same! i am a total stats junkie and would love to see info like this. if not for what the population as a whole is doing at least for myself ala the stats itunes collects. Does some of this information not give you the willies? Remember when the Patriot Act tried to get libraries to tattle? For some people, Kindle is a remarkable invention. But I want to hold my books, and have the sensual experience of feeling the paper and weight of a book in my hands. I don’t want any of that information collected about my reading habits. They’d best offer a way to opt out. No one else has any right to know what I’ve been reading, or how I read the books I purchase. Corporations: Keep your eyes out of my house! I think this should finally lead to a pay-per-chapter model. For starters: you could purchase all of the book before hand for 80% of the MRP, or you could pay 25% up front and pay the remaining 75% only if you thought the book was worth pursuing. Brilliant Idea: Kindle Can Do for Books What Last.fm Did for Music | Stocks!